Vegetables can easily be defrosted in a pressure cooker, but some meats and poultry lose flavor in addition to color if not partially thawed before placing them in the pressure cooker. 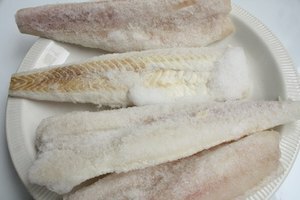 Defrosting frozen meats in the pressure cooker also adds to cooking times, which can lead to the loss of vitamins and minerals in the food. In addition, meats that are completely frozen can cook faster on the outside than on the inside. However, following several steps gives you better results when using your pressure cooker to defrost food. Purchase the ingredients for your pressure cooker recipe. Frozen vegetables can simply be placed in the pressure cooker without pre-thawing. No additional cooking time is required. For meat or poultry, be sure to purchase pieces that are no larger than 1-inch. You can ask a butcher or employee in the meat department of any grocery store to cut the meat. Smaller pieces defrost faster. Place the meat or poultry on defrost in a microwave for a couple of minutes to partially thaw the item. This decreases cooking time in a pressure cooker and allows the meats to cook more evenly. Place the meat or poultry in the pressure cooker and cook as normal based upon recipe guidelines. Any parts that have frozen spots will defrost in the pressure cooker during the cooking process. 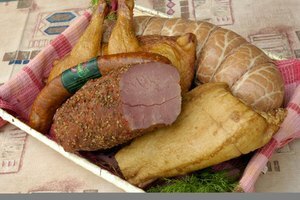 Purchase frozen meat, pork or poultry as desired. 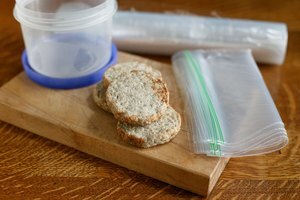 Smaller pieces defrost faster. Add 1 cup of warm water or broth to the pressure cooker before adding any frozen meats, pork or poultry. Add five minutes to the recipe's cooking time for each inch of thickness of frozen beef or pork. Add one minute to the cooking time for each pound of a frozen, whole chicken or turkey. Add four minutes of cooking time for each inch of thickness on a frozen turkey or chicken breast, leg or thigh. Continuously check any meat, poultry or pork with a cooking thermometer. Temperatures should be at least 165 degrees before serving. Do not defrost large chunks of frozen meat in the pressure cooker. This can result in unevenly cooked meat. 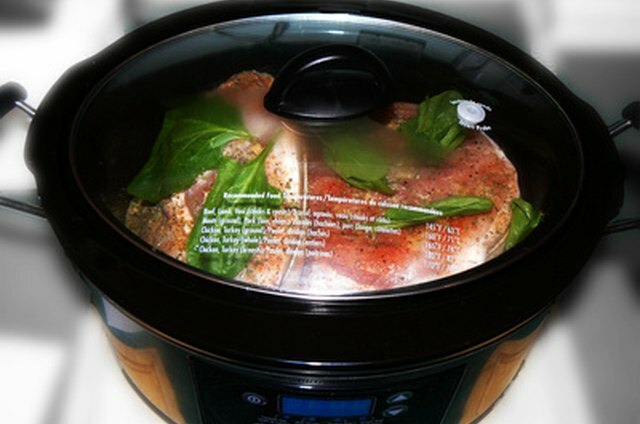 Cooking frozen meats in a pressure cooker can decrease flavors, vitamins and minerals. Thoroughly check the meat to make sure it has been cooked. Often the outside of the meat will cook faster than the inside. iFood.TV: Can You Cook Frozen Foods in a Pressure Cooker?